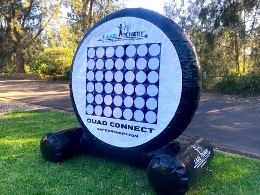 Our large inflatable Stick It Archery Target is a fantastic and safe way for kids to experience archery in any environment! Players use simple longbows to fire modified arrows at The Stick It Target. 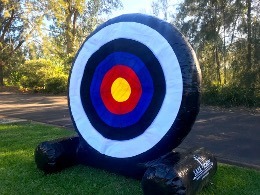 Magnetic velcro discs on the arrowheads grab onto the target to show where the arrow hit! Loads of game variations and team vs team game types keep the event competitive, fast-paced and of course FUN! 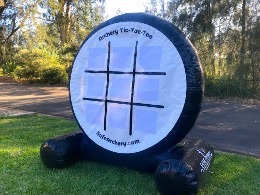 The Stick It Archery Target is used for small or large events! No limit to number of players!